Pianist Connie Han helps revitalize something that jazz aficionados have been into for a while, but for a fresh generation she makes something new that has been defining the jazz language for several decades. If anything, she breathes new life into the Young Lions phenomenon that was jazz’s hallmark in the 80’s and 90’s. A bit of background: in 1976 Herbie Hancock played a career retrospective concert at the Newport Jazz Festival where he had played in contexts he hadn’t in years. At the time, Hancock was knee deep in his forays into funk and disco, and although he never abandoned the acoustic piano during that entire period, his forays into straight ahead jazz were not as plentiful. At this concert Hancock reunited with his band mates from the Miles Davis Quintet: saxophonist Wayne Shorter, bassist Ron Carter, and Tony Williams on drums with Freddie Hubbard replacing the retired Davis on trumpet. The concert and the resultant album, the two LP V.S.O.P. (Columbia, 1976) lead the jazz media to make the bizarre declaration (with hindsight) that acoustic jazz had returned. Acoustic jazz had never died, it just became less popular amidst the countless jazz-rock and jazz-funk classics from artists like Hancock, Chick Corea, Return to Forever, Billy Cobham and Weather Report that were being churned out at a rapid pace. Labels such as ECM were recording cutting edge acoustic music, and labels such as Xanadu, Pablo and Concord catered to mainstream jazz lovers that cherished hard swinging music. Woody Shaw was recording some of his strongest music at Columbia, and Dexter Gordon experienced a mid career renaissance in the United States. Han’s Mack Avenue debut Crime Zone featuring the astonishing Los Angeles born 22 year old pianist stylistically comes from the period described above, and the “young lions” era of jazz that defined the 80’s and 90’s. The Young Lions movement was a heavily marketed, major label driven focus on acoustic jazz stamped by the sentiment that young black musicians were eager to get back to the sound prevalent before the stylistic and technological advances that characterized the growth of jazz in the 70’s. The poster children were trumpeter Wynton Marsalis, and saxophonist brother Branford who had grown up in New Orleans and logged time as members of Art Blakey’s Jazz Messengers, and through their own quintet developed a very specific dialect rooted in the Miles Davis Quintet of 1963-68 but with particular musical details that could have only happened after the 70’s as pianist Ethan Iverson noted in his article The J Word. The Marsalis group developed a telepathic rapport within the rhythm section of the late Kenny Kirkland on piano, bassist Charnett Moffett and drummer Jeff “Tain” Watts where carefully calculated metric shifts would occur on a dime on the classic Black Codes From The Underground (Columbia, 1985) with unusual twists, such as a single measure of ¾ on “Delfeayo’s Dilemma”. They would develop a language versed in these devices and also in a style of tune called “burnout” rooted in mid 60’s John Coltrane that explored tonality and metric shifts to the breaking point. This language would influence contemporaries such as Kenny Garrett, Mulgrew Miller, Ralph Peterson, Wallace Roney and Terence Blanchard, and would extend to the next generation including Joshua Redman, Christian McBride and the late Roy Hargrove. The pianist extends this narrative on Crime Zone featuring longtime Blanchard associate Walter Smith III guesting on tenor saxophone for several selections alongside her working trio of bassist Edwin Livingston, and drummer/co writer/producer Bill Wysaske. She also embodies a prodigious explosive quality that announced several pianists to the scene in the last two decades like Eldar Djangirov, Hiromi Uehara and most recently this decade, teenage phenom Joey Alexander. All of these pianists displayed the influences of Oscar Peterson, Herbie Hancock, Chick Corea, McCoy Tyner and Keith Jarrett, but Han adds an additional wrinkle: while her storming left hand suggests Tyner in the use of quartal harmony, she draws heavily on the influences of the late Kenny Kirkland and perhaps the most imitated pianist of the 80’s and 90’s in mainstream jazz, the late Mulgrew Miller. In the narrow, linear historical narrative of jazz, the contributions of these men are valued heavily amongst their peers as adding to the the language of jazz piano, but historically are not weighed as heavily vs. those of Hines, Garner, Powell, Tyner, Hancock, Corea or Jarrett. Han combines these off the beaten path influences into an intriguing whole. Han, a graduate of the Los Angeles County High School of the Arts was introduced to jazz at age 14, and the technical ability she built studying classical music is a huge asset. She brings a maturity of writing on the Freddie Hubbard tribute, “Another Kind of Right” beyond her years. Cleverly using the bass line of Hubbard’s classic “One of Another Kind”, the melody featuring Smith III in tandem with trumpeter Brian Swartz sparkles with the kind of swagger the trumpeter had, particularly on the bridge. Han’s solo on Fender Rhodes forward momentum recalls Billy Childs, who played with the trumpeter in the early 80’s, while Schwartz’s bold brassiness hints at Hubbard’s absolute peak. Han’s gift with left hand and piano bass unisons is in evidence on the title track, an episodic post bop burner that calls to mind an retro futurist metropolis, the type seen in anime such as Akira, Ghost In The Shell, and Bubblegum Crisis. Smith III’s throaty Joe Henderson and Joe Lovano inspired tenor surges forth, prancing along Wysaske’s strong Latin inspired and swing grooves and Han’s assertive comping. Han’s solo carries unshakable forward momentum, Wysaske showing how strong an influence Jeff “Tain” Watts has been to drummers by exploding with his signature swiss triplets in a grouping of 5, around the 5:08 mark. Han’s muscular left hand is also a highlight of “Southern Rebellion”, the melody line consisting of a gritty first few block chords and eventual spiraling octaves being answered by a knotty unison with Livingston are one of the most burning moments on the album. Han’s solo charges with a take no prisoners attitude much in the same way Mulgrew Miller did on “Joshua” from Live At Yoshi’s, Volume 2 (MaxJazz, 2004). Wysaske follows suit with a drum solo rising to a slow boil with melodic development on toms and high hat splashes. Not everything is taken with flaming intensity, Han shows herself to be equally lyrical and soulful on Steven Sondheim’s “Pretty Women”. The floating, funky “Gruvy” showcases her again on electric piano, the chorused Rhodes bringing us back to the 80’s, with a touch of Bob James, and the appealing line offers a nod to Hancock’s “Dolphin Dance”. The pianist’s ingenious arrangement of Joe Henderson’s “A Shade of Jade” incorporates Joe Chambers iconic beat on the tune’s head applied to her left hand in a stunning solo rendition. 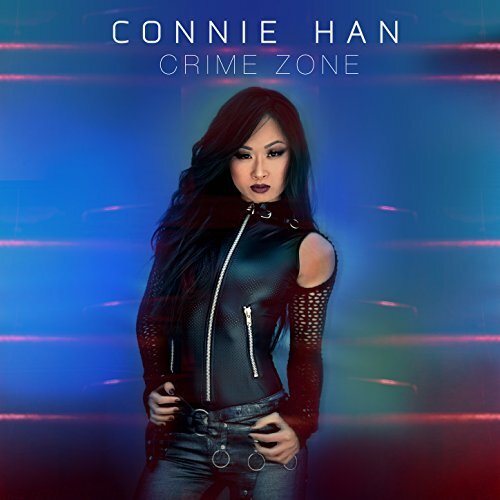 With Crime Zone, Connie Han proves herself to be an exciting player with a lot of upside. Coming from the perspective of 80’s and 90’s Young Lions puts an interesting spin on being in the tradition because it shows that records from the likes of Wynton, Branford Marsalis, Kenny Garrett and Jeff “Tain” Watts were as much an inspiration as what came before to the subsequent two or three generations. With her unconventional cyber punk look on the album cover she may even bring some listeners to jazz who may not even been interested otherwise. Han has also come along in a period that is brighter than it’s ever been for female musicians as she is among the ranks of such names as label mate Tia Fuller, Camille Thurman, and Thana Alexa. Han will also provide inspiration for young Asian American women who are looking to make a mark on the current jazz scene and her major label debut is filled with the promise of wonderful things to come. Han would make a brilliant addition to the Mack Avenue Superband, or perhaps as a foil for Kenny Garrett and the type of explosive material found on his Songbook (Warner Brothers, 1997) Pushing The World Away (Mack Avenue, 2013) and Do Your Dance (Mack Avenue, 2016). The album though recorded in LA also possesses tough muscle that is found in most New York jazz and a wonderful late year find.